The most striking thing you see is that it is the size of a 16 pin DIP, and unlike other processor boards, it is designed from the start to be compatible with the white breadboards that are commonly used by electronic hobbyists, robotics projects, and oh so many hackaday projects. The pins are directly designed to work with these bread boards, and unlike the usual pin strips found on other processor boards, they plug in easily to the bread board, and don’t damage it. 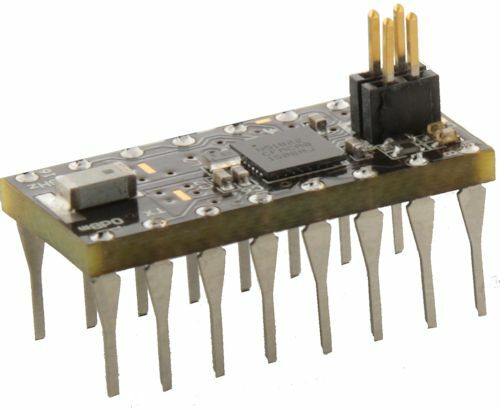 Unlike other processor boards that are far larger, OSHChip can be plugged into the middle two rows of a bread board, and it doesn’t cover the connected holes that you will be connecting to. View 2: You get to be a chip designer. Imagine you wanted to design a chip. Nothing too fancy, but let’s including some general purpose digital inputs and outputs, some analog inputs, some counters, timers, or PWM, maybe able to talk to another chip over SPI or I2C, some storage for calibration constants, maybe a linearization table, and an on-board processor that can be programmed in C. While we are dreaming, lets also include a low power mode that only draws a microamp or two, can communicate with a UART to a terminal program on your computer, and lets add in a 2.4 GHz radio that can operate with the Bluetooth Low Energy protocol to smart phones, like Android phones and iDevices. © 2017 OSHChip. Powered by Jekyll using the Minimal Mistakes theme.